Does the Sri Lankan Election Herald a Viable Indo-Pacific? A month and a half ago, a diverse coalition of parties and political, ethnic, and faith-based groupings produced an election upset in Sri Lanka. The ousted Mahinda Rajapaksa, an increasingly autocratic ruler intent on strengthening both his domestic grip and strategic ties with other autocratic regional states, was sidelined by Maithripala Sirisena in what has been called “a blow for democracy.” This opens an uncharted chapter in Sri Lankan political history, one that comes soon after the cessation of long-term civil hostilities. But how does this unexpected democratic transition bode for the entrance of an on-side regional player more amenable to Western interests? Perhaps well. More interestingly and importantly: What does the Sri Lankan transition broadly mean for the Indo-Pacific region as a strategic entity? The Sri Lankan electoral upset on January 8 was largely lost amid coverage of the Charlie Hebdo events the day before. Despite limited coverage at the time, the election outcome has significant long-term implications for the Indo-Pacific. Sri Lanka sits in the middle of the Indian Ocean with a population of just over 20 million. Further, it promises strong economic growth that is likely to be sustained, particularly in its post-conflict transition. Under Rajapaksa, Sri Lanka was heading comprehensively into a Chinese camp. In some ways it was to be the centerpiece in a Chinese String of Pearls stretching from the Persian Gulf through Malacca – the other strategic fulcrum of the Indo-Pacific – to the South China Sea. There was much hope, stoked by the incoming government’s coalition on the campaign trail, that Sri Lanka’s tendency towards China would be reversed. Despite expectations and the vows of opposition, it has now emerged that the main Chinese-Sri Lanka port project will go ahead. The new government’s earlier, public dissatisfaction with increasing Chinese influence and investment – as well as its potential environmental impacts – now appear to have been overridden by political imperatives. Officially the new government has cited satisfaction with an environmental report for the reversal of opposition to Chinese investment. However, the need to avoid confrontation with China and the potential diplomatic backlash of rejecting vast Chinese investments in the first months of government and at a critical point in Sri Lanka’s post-conflict transition appear to be the more important and immediate concerns. These investments constitute a crucial part of China’s regional strategy, the Maritime Silk Road, and Sri Lanka’s pragmatism is perhaps prudent. This outcome doesn’t necessarily mean that Sri Lanka will be less amenable towards its major northern neighbor, India, and the West, as certain analyses have suggested. However, it does introduce extra complexity into parsing Sri Lanka’s potential future role in, as well as the overall constitution of, the region. China’s interest in the Indo-Pacific has attracted significant attention from Western strategists and political observers. This attention has brought ripostes from Chinese spokespersons insisting on China’s purely economic focus in developing maritime facilities along the String. China harbors deep worries that the Indo-Pacific idea will justify Indian projection further East, just as India is anxious about existing Chinese designs on the Indian Ocean. This all points to a fundamental fact and the take-home lesson: Emerging regional dynamics (including the broad wake of such events as Sri Lanka’s election) indicate a viable and real Indo-Pacific which has never in the past so directly defined calculations of Asian geopolitics. As a concept, the Indo-Pacific is only just now coming into its own. In many countries’ policies it has a checkered history alternating between neglect and outright dismissal. The United States has recognized the Indo-Pacific as the globe’s economic center of gravity even as the region’s balance of power continues to change. The U.S. has responded with the putative Asia pivot and a long-term strategic reorientation eastward towards the Indo-Pacific, including increased stationing of U.S. military assets in Australia. After a series of awkward strategic amalgams in Australian foreign policy itself, the Indo-Pacific has been adopted as a whole-of-government outlook by that regional middle power. These realignments lend weight to the fact that the Indo-Pacific is shaping up to be the strategic concept par excellence for major Asian players in the early 21st century, reluctantly or not. A horizontal – rather than vertical – conception of Asia more clearly reflects economic and strategic realities at sea and on land. Sri Lanka’s democratic transition and the pragmatic decision to not exclude China bode well for a positive Indo-Pacific pluralism. Even if these developments introduce more political immediacy and complexity, they will help Indo-Pacific players balance key diplomatic and strategic relationships with commercial interests in an extremely diverse region. One can hope that all Indo-Pacific nations will not only find more in common with an emerging democracy at the fulcrum of the Indian Ocean but a worthy partner. 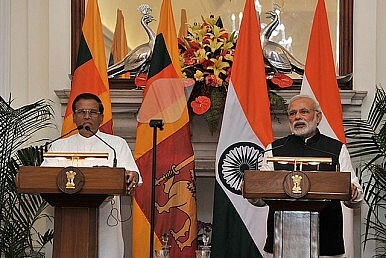 An invigorated India, the world’s largest democracy, the potential emergence of a democratic – if pragmatic – Sri Lanka, and hopes for a more open Myanmar and Iran on the Indian Ocean rim, swing the pendulum towards a more integrated and (perhaps) cooperative Indian Ocean and Indo-Pacific. Sri Lanka’s decision to continue its engagement with China, despite reservations, pushes further in this direction. These developments will diversify the enmeshment of Asia, allowing regional countries to balance longstanding ties while also making the Indo-Pacific’s geopolitical character more inclusive and pluralist. In short, the Indo-Pacific is not only viable as a strategic entity, but it has become very real. William Jenkins is developer and lead of the Australian National University’s (ANU) flagship Arabic and Persian Language Online Programme and is Young Australians in International Affairs’ (YAIIA) Indo-Pacific Fellow. He writes on Middle Eastern as well as Central and South Asian political and economic developments. An earlier version of this article was published by Young Australians in International Affairs. The election result opens the door to reforms in Sri Lanka’s foreign policy.